An oar is an implement used for water-borne propulsion. 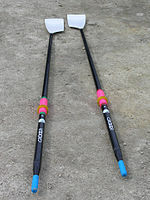 Oars have a flat blade at one end. Rowers grasp the oar at the other end. The difference between oars and paddles are that oars only have one blade, and are used exclusively for rowing, whereas paddles can have either one or two blade and are not rowed. Oars for rowing are generally connected to the vessel by means of rowlocks or tholes which transmit the applied force to the boat. In this system (known as a second class lever) the water is the fulcrum. By contrast, paddles, like those used by canoeists, are held in both hands by the paddler, and are not attached to the vessel. Rowers generally face the stern of the vessel, reach towards the stern, and insert the blade of their oar in the water. As they lean back, towards the vessel's bow, the blade of their oars sweeps the water towards the stern, providing forward thrust – see lever. For thousands of years vessels were powered either by sails, or the mechanical work of rowers, or paddlers. Some ancient vessels were propelled by either oars or sail, depending on the speed and direction of the wind (see galley). Rowing oars have been used since the early Neolithic period. Wooden oars, with canoe-shaped pottery, dating from 5000–4500 BC have been discovered in a Hemudu culture site at Yuyao, Zhejiang, in modern China. In 1999, an oar measuring 63.4 cm (2 ft) in length, dating from 4000 BC, was unearthed in Ishikawa Prefecture, Japan. The oars used for transport come in a variety of sizes. The oars used in small dinghies or rafts can be less than 2 metres long. In classical times warships were propelled by very long oars that might have several oarsmen per oar. These oars could be more than a dozen metres long. The sport of competitive rowing has developed a tradition of using an oar as a memento of significant race wins. A 'trophy oar' is not presented at the end of the race as a more familiar precious metal cup might be, but rather given by the club, school or university that the winning crew or rower represented. The Norwegian municipalities of Fedje and Herøy both have oars in their coat-of-arms. ^ "2011 FISA Rule Book". FISA. p. 53. Retrieved 19 January 2013. ^ Deng, Gang. (1997). Chinese Maritime Activities and Socioeconomic Development, c. 2100 B.C.-1900 A.D. Westport: Greenwood Press. ISBN 0-313-29212-4, p. 22. ^ Miriam T. Stark (15 April 2008). Archaeology of Asia. John Wiley & Sons. p. 130. ISBN 978-1-4051-5303-4. Retrieved 5 October 2012. ^ The Japan Times. (February 10, 1999). Oldest oar unearthed from Ishikawa ruins. Retrieved on 2008-08-13. ^ Beltz, Ellin. "Translations and Original Descriptions: Turtles". Scientific and Common Names of the Reptiles and Amphibians of North America – Explained. ebeltz.net. Retrieved 2007-02-06.